VMware has released updates that address a LDAP certificate validation vulnerability (CVE-2015-6932) in vCenter Server.A remote user that can conduct a man-in-the-middle attack can intercept network traffic between the LDAP server and the target system. According to a Wednesday advisory, VMware vCenter Server 6.0 and VMware vCenter Server 5.5 running on any system should be replaced with version 6.0 update 1 and version 5.5 update 3, respectively. Versions 5.1 and 5.0 are not affected. 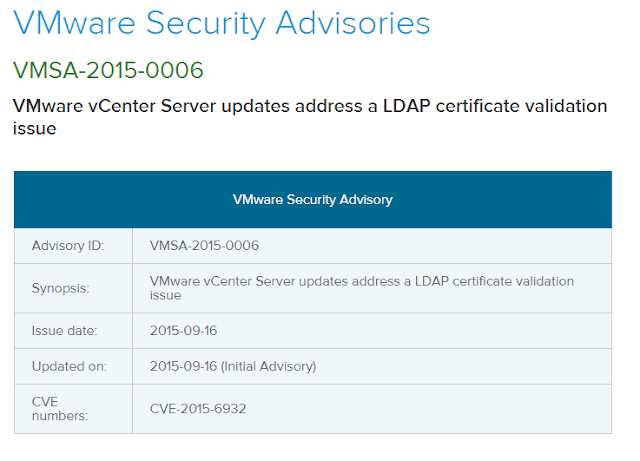 VMware released the patch for the vCenter Server vulnerable version.Update the vCenter Server to latest version to protect the data. Don't forget to verify the checksum of download file while updating the server.